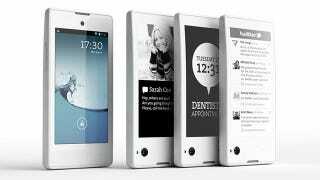 It's the sort of concept that seemed too adventurous to ever make it to market, but this dual-screened YotaPhone is now available. At least, it is if you live in Russia, Germany, France, Austria or Spain. The YotaPhone, priced at €499, runs Android and combines a standard 4.3-inch 720p LCD touchcreen up front with a 4.3-inch E-Ink screen around the back. A 1.7GHz dual-core processor, backed by 2GB of RAM, powers the handset. The idea is that the low-powered E-Ink screen can be left on at all times, only updating when new notifications come in, allowing you to take a glance at incoming messages without chewing through power reserves. It'll also be a fair bit more comfortable for lengthy reading sessions, while the fact that E-Ink screens retain the last image pushed to them even when out of juice could be useful for when the handset's battery does eventually completely conk out.